Not just taking over his big brother's life, he's now taking over Pop! 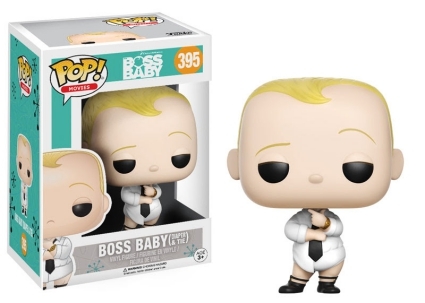 Movies with the Funko Pop Boss Baby set. The initial release offers two versions of the tiny tyrant. The Boss Baby, a DreamWorks Animation film, follows Tim Templeton, a seven-year-old whose life is turned upside-down when his parents bring home his baby brother. Voiced by Alec Baldwin, Boss Baby Templeton and his older brother Tim must overcome their sibling rivalry to take down the evil Puppy Co. and save the world's supply of love. 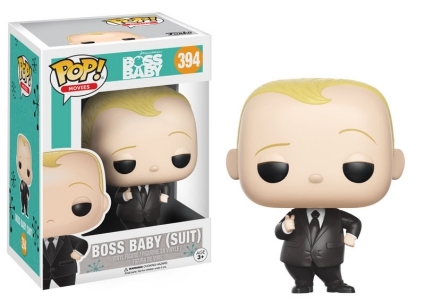 The first option for Funko Pop Boss Baby features the "born leader" pointing his finger with his other hand on his hip. He is shown wearing his signature black Armani suit, complete with a white collared shirt, black tie and even loafers. 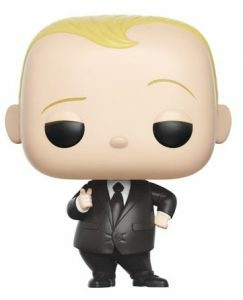 With the same swirl of blonde hair, the second figure also shows him with his shirt and tie. However, this time Boss Baby Templeton is posed in a diaper rather than pants. And, like a true businessman, he is wearing dress socks along with sock garters and a gold watch. Numbered into the Pop! 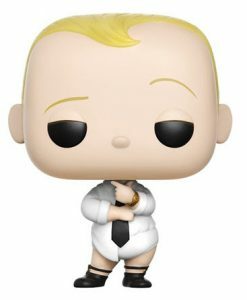 Movies line, Funko Pop Boss Baby vinyl figures appear slightly smaller than the standard 3 3/4" Pop! size.